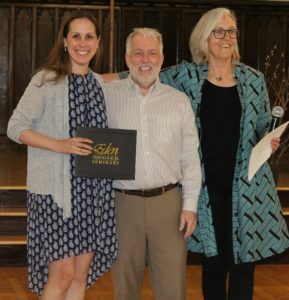 The 2018 Eden student awards were presented during chapel on May 7, 2018. 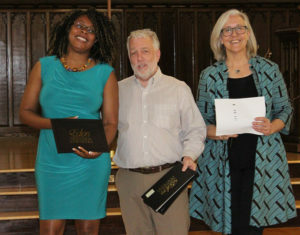 Congratulations to our student award winners who are pictured below with President David Greenhaw and Dean Deb Krause. Given to a student who wished to continue their studies. Recognizes promise for congregational ministry related to faithfulness in preaching and pastoral care. 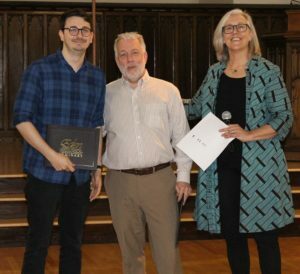 The recipient(s) is the student judged by the faculty to demonstrate solid academic achievement, a love of Christ’s church and excellence in both preaching and pastoral care. Given to the Spring Convocation preacher. Given to the highest ranking MDIV student at the end of the first year. Given to a deserving student pursuing preparation for parish ministry with priority consideration to sons and daughters of the Kentuckiana Association of the Indiana-Kentucky Conference of the UCC. 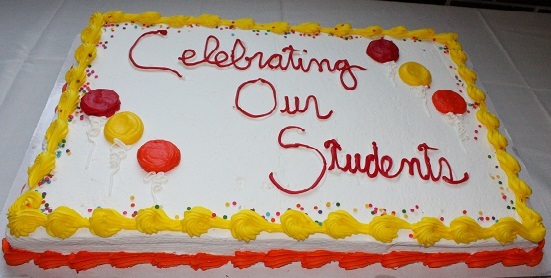 Given to the UCC student in care and selected by the administration. 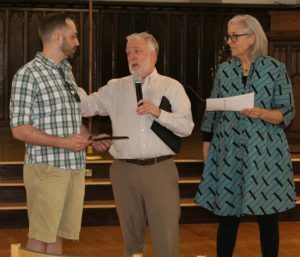 A financial award given to a deserving MDIV student. Given to the student deemed to excel in business acumen whose skills will be transferable and useful in the individual’s ministry. In anticipation of our upcoming commencement, Eden Theological Seminary announces the selection of three outstanding community leaders who have earned the institution’s highest recognition and will be awarded honorary degrees. 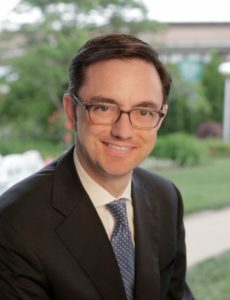 Timothy O’Leary, general director of Opera Theatre of Saint Louis, will receive a Doctor of Humane Letters in recognition of his relentless commitment to tackling innovative, artistic programming that often incorporates significant social messages and brings national acclaim to the St. Louis community. Two examples include Opera Theatre’s 2011 production of the rarely staged The Death of Klinghoffer, which chronicles the Achille Lauro incident of 1985, and the company’s 2016 world premiere of Shalimar the Clown, based on the novel by Salman Rushdie. 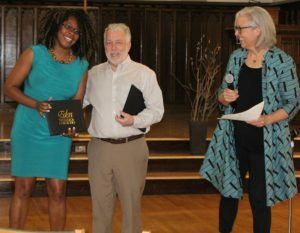 A member of the board of directors of the St. Louis Diversity Awareness Partnership, as well as a steering committee member for Arts and Faith St. Louis, O’Leary gathered input and feedback from diverse members of all faith groups prior to producing these works. Because of his steadfastness and dedication, these operas inspired informed, thoughtful discussions within the St. Louis community and around the globe, as well as earning widespread acclaim. Known throughout the St. Louis area as MamaCat, Cathy Daniels will receive a Doctor of Humane Letters. Daniels, a community and business leader, has become a regional advocate to among a wide contingent of activists, faith leaders, community organizers, and concerned citizens to raise awareness and meet the needs of unhoused people in the St. Louis. During her work with the Ferguson movement and the Michael Brown protests, she was awakened to the unmet needs and plight of homeless people in St. Louis. 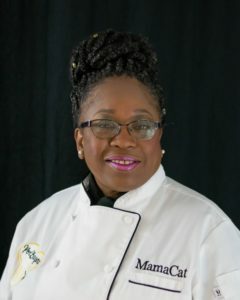 She has subsequently created a collaborative partnership which prepares more than 150 meals each week to deliver nutritional and spiritual sustenance to those whom she refers to as “unhoused family” on the streets of St. Louis. Author and editor Elisabeth Sifton will be awarded a Doctor of Humane Letters. Sifton is the daughter of well-known Eden alumnus Reinhold Niebuhr, an American theologian, ethicist, professor, political commentator, and author of The Serenity Prayer. She has worked tirelessly to preserve her father’s legacy and vision, particularly in times of turbulence and change. In addition, she is dedicated to conveying the significance and influence of her father’s work on world leaders including Barack Obama, Jimmy Carter, and Martin Luther King, Jr., to name just a few. Sifton is the author of The Serenity Prayer: Faith and Politics in Times of Peace and War. 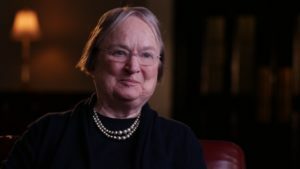 She recently edited Reinhold Niebuhr: Major Works on Religion and Politics, a Library of America volume comprising some of her father’s most important essays. Eden’s commencement will be held on Friday, May 18, 2018 at 7:30 p.m. at Manchester United Methodist Church in Ballwin, Mo. In addition to the honorary degree presentation, Reverend Doctor John C. Dorhauer, general minister and president of the United Church of Christ, will deliver the ceremony’s commencement address. 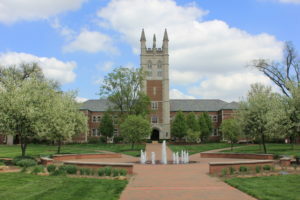 Founded in 1850, Eden Theological Seminary has been educating women and men to become community leaders for more than 160 years, primarily through ordained Christian ministry. Eden offers a variety of professional and graduate degree programs including: Master of Divinity, Master of Arts in Professional Studies, Master of Theological Studies, and Doctor of Ministry, among others. As one of the six seminaries of the United Church of Christ, Eden is a welcoming, inclusive and ecumenically diverse community whose mission is to strengthen the life of the church by educating its students for ministry, enlivening critical reflection on faith, and supporting bold Christian discipleship. 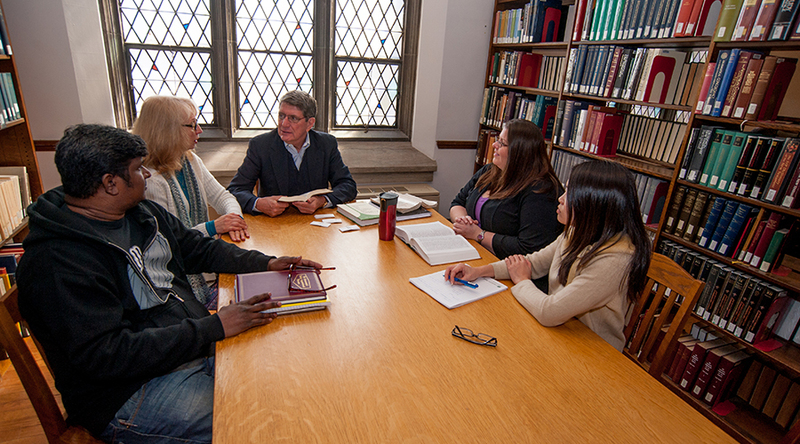 Eden Theological Seminary is accredited by the Association of Theological Schools and the Higher Learning Commission. Eden Theological Seminary is participating in GIVE STL Day on May 2, 2018. 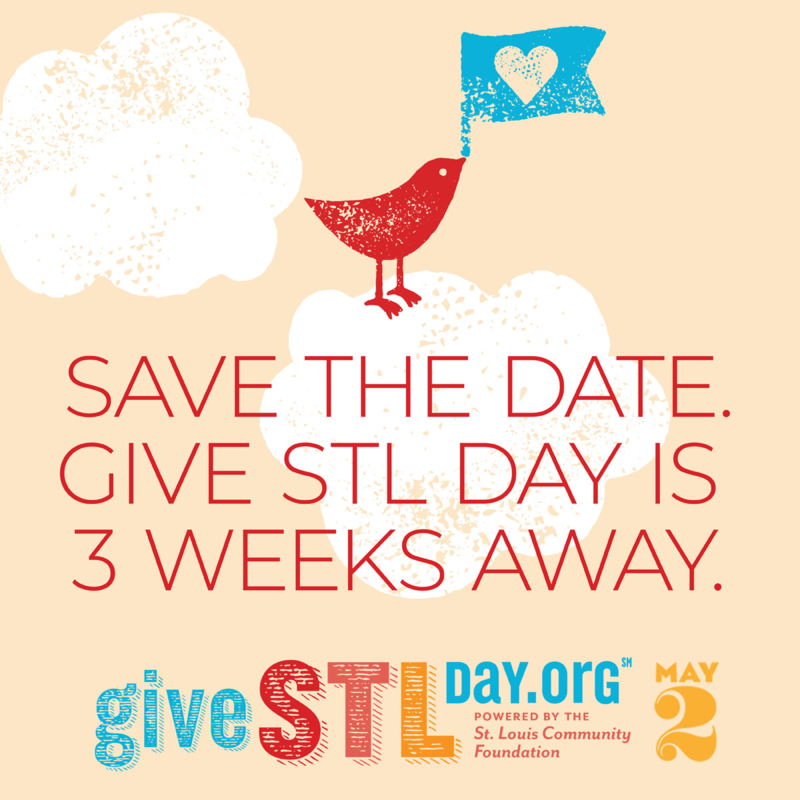 On this day, charitable St. Louisans and others can grab their credit or debit cards, go online to GiveSTLDay.org, and donate $10 or more to one or several of the participating regional nonprofits. Please type in Eden Theological Seminary in the search box to give to Eden on May 2. Your gift can help a seminarian achieve their goals. The Naval Chaplaincy School and Center (NCSC) kicked off the fiscal year 2018 (FY18) Professional Development Training Course (PDTC) for the Navy Chaplain Corps and religious program specialist (RP) community with its first course convening Jan. 9-11 onboard Naval Air Station Jacksonville. The FY18 PDTC is designed to provide chaplains and RPs with the knowledge, skills and abilities to deliver meaningful religious ministry to millennials who are religious, have no religious preference, or who have disaffiliated from religion. “The younger women and men of our sea services today search the digital frontier for companionship in their spiritual journey with God,” said Lt. Chris Terrell, assigned to Naval Air Station Pensacola. He felt the course provided an educational, horizon-broadening understanding about one of today’s ministry opportunities. “What I perceive as our challenge is to learn new ways and social mediums to do what has always been our mission — effectively caring with Sailors, Marines, and Coast Guardsmen in their faith expressions, always supportive as they serve their nation and the world,” said Terrell. Two subject matter experts with knowledge of the military community and how technology impacts society led the PDTC by translating their knowledge into usable military skillsets through an engaging and interactive learning setting. The Rev. Dr. Kristen Leslie, professor of pastoral care and theology at Eden Theological Seminary, has more than 20 years of experience teaching and consulting with Operation Enduring and Iraqi Freedom chaplains on issues of pastoral care. Dr. Kate Ott, associate professor of Christian social ethics at Drew University Theological School, has written extensively on the role and impact of technology on ethical development. The professors’ presentation helped chaplains and RPs as they work to enhance fleet and warfighter readiness in the context of this evolving ministry challenge. The FY18 PDTC will be offered at 10 more fleet concentration area and overseas locations. Quota and location information is available online through the Catalog of Navy Training Courses and read ahead materials through NCSC’s page at https://www.milsuite.mil/book/community/spaces/navychc/naval-chaplaincy-school-center. 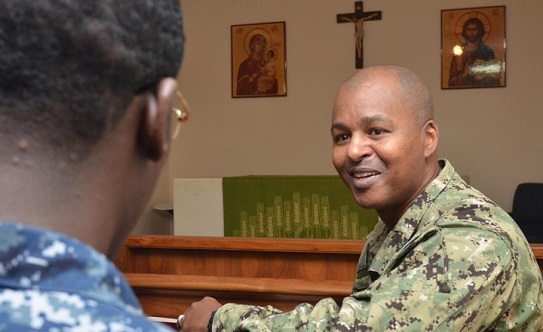 For information about the Naval Chaplaincy School and Center, visit https://www.netc.navy.mil/centers/chaplain/. For additional information on the Naval Education and Training Command, visit the NETC website: https://www.netc.navy.mil or http://www.navy.mil/local/cnet/. Growing up in a community just outside Cincinnati, Ohio, helped shape William “Bill” Schwab’s life in more ways than one. Schwab, 76, described his childhood living situation in simple terms. Five families shared 5 acres and basically lived intertwined lives. 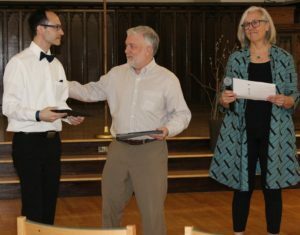 Living with other families instilled a strong sense of community in Schwab, something he believes led him to a career in the ministry and eventually a job as the pastor of St. Peter’s United Church of Christ, Washington. In college he was a sociology and anthropology major at the University of Cincinnati. After that, he decided to go to seminary. He ended up at Eden Theological Seminary in Webster Groves. Early on, he admits he wasn’t sure he made the right call. Schwab said seminary allowed him a chance to experience the whole gamut of what the ministry had to offer. Schwab was able to spend time with people of a variety of different backgrounds at a time, during the civil rights movement, that made a lasting impression. He got his start at a church in O’Fallon. He spent eight years there before coming to Washington, but not St. Peter’s. Schwab said the Church of Christ called him and offered a position in administration. He did that job for a few years, but missed being in the church — he missed the community. “I really missed being in a parish,” he said. The church agreed to let him out of his administrative duties and put him back in charge of a congregation. He was able to take over as the pastor of St. Peter’s. Schwab called the job time-consuming and rewarding. Being the pastor meant being involved in people’s lives — he was around for baptisms, weddings and funerals. The job often meant being on-call 24/7. Constantly having to be available may be a burden for some people but Schwab said it was the best part of his job. He said being with people in crisis was the most rewarding part of being a pastor. After 24 years, Schwab retired from St. Peter’s in 2006. “It was a good, long stint,” he said. He’s not entirely retired from the profession, however. He and another pastor split time at Zion United Church of Christ in Oakfield. The two Sundays he works a month allow him to give sermons, but also give him time away from a full-time ministry. Retiring from the church allowed him to connect to another past time from his childhood. Faced with a sudden influx of free time, Schwab become heavily involved with Shaw Nature Reserve. For 13 years, he has volunteered his time working in the lab at the reserve. Schwab said growing up there was always a garden around for the five families. The neighbors grew their own fruits and vegetables and the children were tasked with helping out. He remembers being in charge of spraying the roses. “We didn’t have any livestock, but we basically grew all our own food,” he said. His first job was actually working in a greenhouse. So when it came time to leave the church, getting back to spending time with plants was his plan. Looking to fill the time, he settled on becoming a Master Gardener through the University of Missouri Extension Office. He passed the 10-week course, and during that time he came into contact with Shaw Nature Reserve. “I needed someplace where my time could be flexible, and that worked out,” he said. Once he got certified as a Master Gardener, he took another class from the extension office and became a Master Naturalist. “I learned a lot,” he said. His interest in plants is part aesthetics — Schwab said he loves the way they look — and part an interest in learning. At Shaws he’s gotten down to the nitty-gritty of plant life. “It’s really been a meaningful experience to me,” he said. A big part of the gig at Shaw is working with native plants. Schwab said the team conducts research on the plants native to Missouri. The research leads to the production of the plants and seeds. One of those communities that has used the native plants is Washington. Schwab said since he’s been with Shaw, he’s noticed an uptick of native plants around town. He said the plant life at Phoenix Park, for example, is something he knows he created. “They give me a table in the greenhouse and there’s a lot of plants around town that I’ve donated,” he said. His work at Shaw may be parttime, but he takes it seriously. 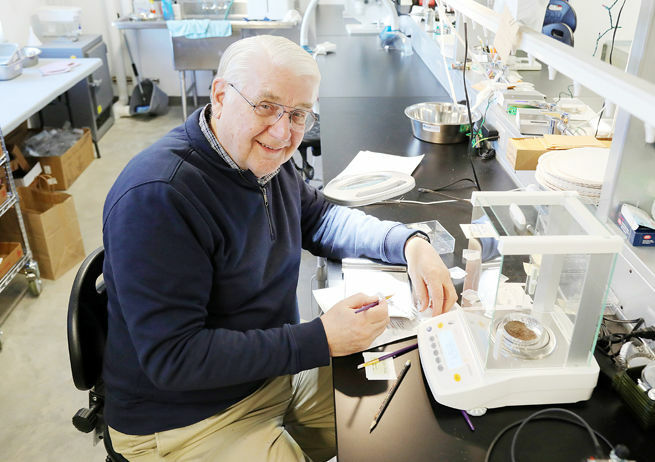 He usually stops by the lab two days a week and has clocked in hundreds of hours. In 2017, he was recognized by the Missouri Botanical Garden as one of the most dedicated volunteers in the organization. “Out of 1,700 volunteers, they recognized eight, so I’m proud of that,” he said. When he’s not at the lab, there’s a good chance Schwab is reading a book. A lifelong reader, Schwab has used his retirement to dive headfirst into his love of books. He reads several books a month. Schwab said during his time as a pastor he read a lot, but not often just to pass the time. He was often looking for sermon ideas or reading Scripture. Without having to prepare a regular sermon, he’s been able to read more — mostly nonfiction. While he occasionally likes to read a piece of fiction, he said he mostly likes to read to challenge his mind. “I’ve been able to read what I want to read, instead of having to read for work,” he said. His favorite topics are biographies and history because it gives him a chance to keep learning new things, he said. “The biographies interest me because I like to see how other people figure out life,” he said. A few times a month, he writes book reviews for The Missourian. Schwab wrote thousands of sermons in his life, but writing about books was a new outlet for his words. When not reading, he volunteers for other groups and stays active. He is a longtime supporter of the Washington Historical Society and a past president of the group. Schwab still resides in Washington with his wife, Diane. The couple have been married for 52 years and have two adult children, Jeff and Jennifer, and four grandchildren. WESTMORELAND — Lynn Wickberg knew she wanted to be a pastor when she was 11 or 12 years old, but it took her nearly 50 years to get there. She has been in her cozy, book-filled office at Westmoreland’s United Church of Christ since July 1, but she spent most of her professional life in medicine — first as a nurse, then as a child psychiatrist. 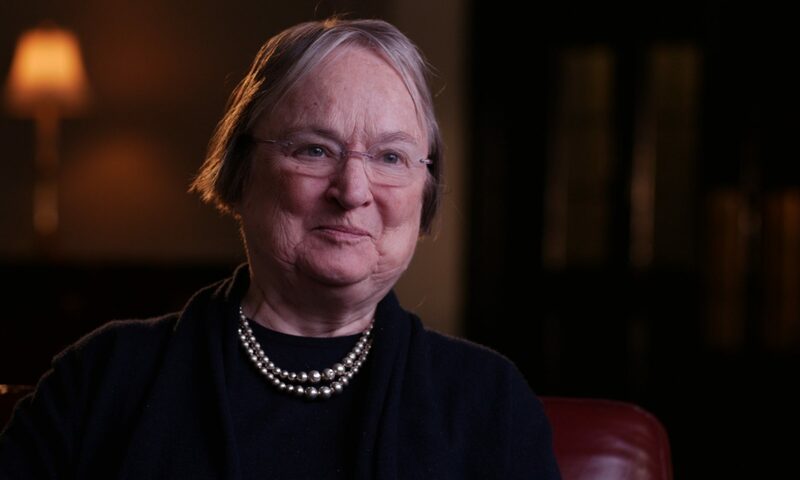 Growing up in central Ohio when she did, women (who, she notes, would’ve been called “girls” at the time) were expected to go into nursing or teaching if they pursued higher education. She remembers talking to the pastor of her Lutheran church, saying she knew “deep down” that she wanted to be a pastor when she grew up, and being dismissed because of her gender. “I got a proverbial, not literal, pat on the head. ‘That’s nice, Lynn, but you’re a girl.’” But things “were changing along the way,” she notes, with a smile. Initially, Wickberg went to school for music, but transferred to nursing when she realized she wasn’t going to be a professional musician and that she didn’t want to teach music. After graduating from Central Ohio Technical College, she landed in New England, where she was working when a friend suggested she join her on an eight-week travel-study seminar in Europe. “I thought, well, if I work overtime, I could,” Wickberg recalls. And it was a good thing she did. It was on this trip that she met her future husband, Robert Wickberg. After the seminar ended, “he decided to keep the connection,” she says. The two were engaged and then married. Her husband is a native Vermonter, and they decided to move back to his home state to start their family. Although Wickberg describes herself as a “transplant” to the region, it’s home now. So, despite having two young children — Timothy and Laurel — she decided to go to medical school to become a physician in a family practice. “I went to the University of Vermont — or, I like to say, we went as a family. We had an apartment in what they used to call married-student housing,” Wickberg remembers, with a laugh. Along the way, though, her path changed again. She opted to become a child psychiatrist, rather than a traditional doctor. After graduating from medical school and completing residency and fellowship training at Dartmouth-Hitchcock Medical Center in Lebanon, Wickberg was employed by Dartmouth Medical School as a clinical associate and instructor in psychiatry, with assignment as a consulting child and adolescent psychiatrist at Monadnock Family Services. She felt she was doing good work, but still felt unsettled. 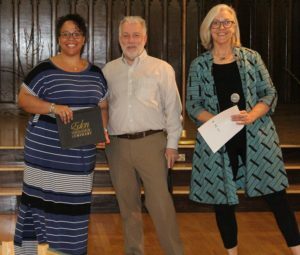 It wasn’t until her two children left for college that she went through the Vermont Academy of Spiritual Training, a program through the Vermont conference of the United Church of Christ that aims to provide further education to laypeople. At that point, she had begun leading Sunday service at Christ’s Church in Saxtons River once in a while when her pastor was away. She carpooled to class with a friend one Saturday every month for three years, and they talked about the coursework, which covered a wide range of topics, including scripture, theology and worship traditions. This was all part of a growing sense she had of being called to ministry, until in 2012, when she left her home in Westminster, Vt., to go to Eden Theological Seminary in St. Louis. Which is not to say there weren’t challenges along the way. Wickberg received mixed responses when people found out she was going to seminary. Some thought it was cool; others were confused. Either way, she says, she made the right choice. But she adds that simply feeling called to ministry isn’t enough. “Yes, there’s that personal, ‘Yes, it’s me and God, and this is what I should do.’ Yes, that’s part of it, but that’s not the only part,” she says. There’s also rigorous work before becoming a licensed minister. The three years at the seminary were intense, much like medical school, Wickberg notes, but the learning community was wonderful. She put in many hours of work in different settings before she could be ordained by the Ecclesiastical Council. 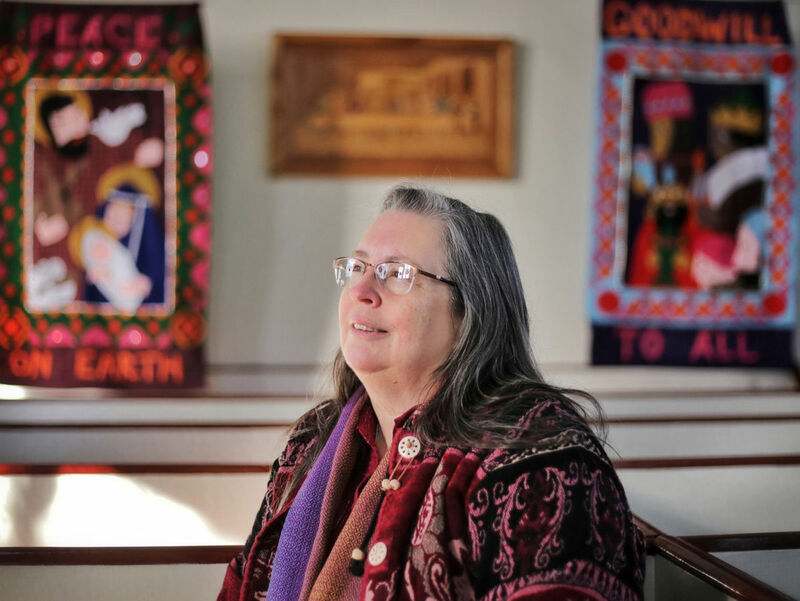 First, she worked as a student pastor at a large church outside St. Louis, then in chaplaincy training at Dartmouth-Hitchcock Medical Center in Lebanon, and then as an interim pastor at United Church of Strafford, Vt.
Each setting contrasts in some way with the Westmoreland United Church, but she found there are commonalities between different people’s lives and needs. Then she ties whatever she sees as the overarching theme for the week into the service’s hymns and prayers. One afternoon per week, she leaves her office door open for anyone who might like to talk, and sometimes, she visits hospitals or nursing homes. But she says all members of the church look out for each other, whether someone needs help painting a house or just a visit from a friend. But being part of a community doesn’t mean being cloistered, she stresses. “God’s justice is that all have what they need: shelter, food, potable water, meaning in their lives, safety — and that’s a lot easier said than done.” For this to happen, Wickberg explains, people must want not only to feed the hungry but to know the hungry. “Social and political discourse in our country and in our world … is prone toward exclusion and hate.” But this isn’t new, she notes; it’s been happening for millennia. That’s where the hard work of love comes in, she says — the kind of love that allows us to shape our words and actions to not breed further hate, without backing away from the truth. Wickberg sees the church as a place where people can find support to strengthen and sustain their desire to do good in the world. Jeanie Sy, who was chairwoman of the search committee for a new minister, says they were looking for someone who would nurture the congregation while increasing its community involvement and reinvigorating their educational programs. Sy emphasizes Wickberg’s creativity and musicality, and her ability to listen and engage all members of the congregation, regardless of their age. Sy admires the life path Wickberg has chosen. But Wickberg says it’s not really about her; she’s just the pastor. 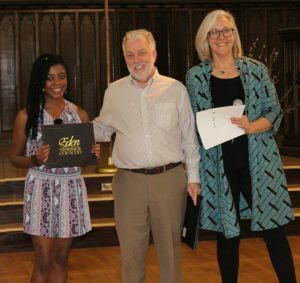 Now in its 16th year at Eden Theological Seminary, the 2017 international travel study seminar program offered one of the most interesting experiences to date. 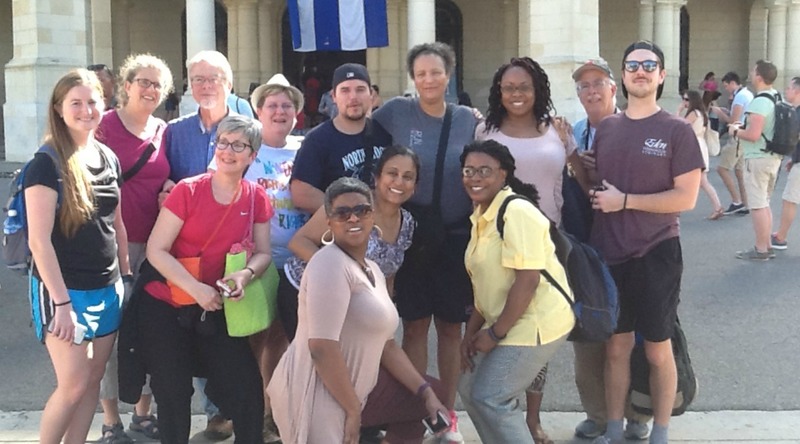 It was Eden’s first trip to Cuba and a cross-cultural experience rich with timely connections, including the recent death of Fidel Castro and the July 2015 restoration of diplomatic relations between the U.S. and Cuba. As with all international travel study seminars at Eden, students focused on gleaning as much as they could from immersing themselves in the culture and in the life of the church in Cuba. They heard testimonies from locals and discussed each evening how their experiences could inform their ministry. According to McCann and Leslie, Eden’s goal for every cross-cultural trip is to have seminarians come back with a different worldview and understanding of how society can be organized—a deconstruction of pre-conceived notions about culture, religion, and politics. On August 9, 2014, Ferguson, Missouri, a suburb of St. Louis, was the site of what has become a modern day “shot heard round the world.” On that day Micheal Brown, an unarmed black teenager, was shot and killed by a local police office. And on that day, the #BlackLivesMatter movement took hold, one of the longest running acts of civil disobedience in our nation’s history. Since day one, Eden alumni, students, and faculty members have played significant roles working in and alongside the movement, not only as protesters, but as advocates for real and tangible change. 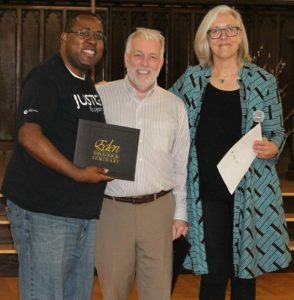 Their passionate work testifies to the quality of students and graduates Eden cultivates; many say Eden dramatically helped shape their theological perspectives on race and human dignity. 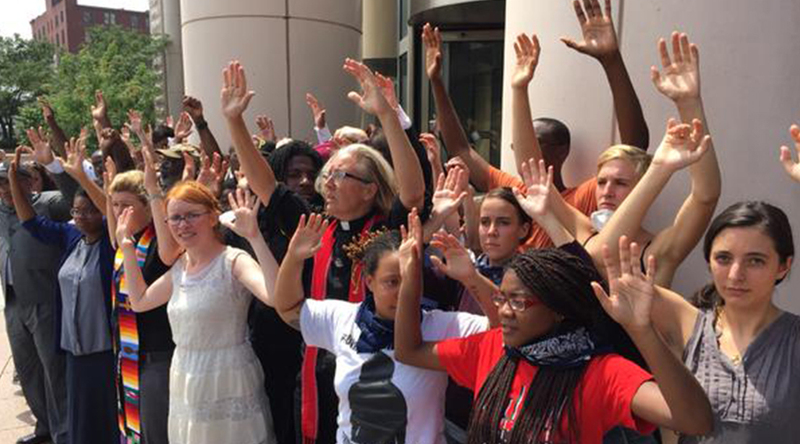 While hundreds of Eden alumni have visited Ferguson to protest and advocate for an end to racial injustice, participated in local protests in their own communities, or preached and advocated for racial equity, several Eden students and alumni names continue to appear among leaders in the ongoing movement. Here are just a few of their stories. In 2009, alumna Rev. Traci Blackmon became the first female pastor of the 156-year-old Christ the King United Church of Christ in Florissant, Missouri. The position fit her strong call to Christian ministry, experience growing up in the AME church, as well as her years of studying Bible and Womanist Liberation Theology at Eden. It felt like a natural progression alongside her 30-year career as a nurse and Coordinator for health, mind, body and spirit for BJC HealthCare. When Michael Brown Jr. was shot, less than 5 miles from Chris the King, Rev. Blackmon was one of the first pastors to respond, both by her presence in the street protests and by calling together neighborhood and state religious and community leaders for a peaceful and constructive response. She was soon recognized for her work when Missouri Governor Jay Nixon appointed her to the Ferguson Commission, a group of sixteen citizens asked to study the underlying conditions and make public policy recommendations to help the region progress after the death of Michael Brown, Jr. In October of 2015, Blackmon was made executive minister of the UCC’s Justice and Witness Ministries. And just four months later President Barrack Obama named her to his Advisory Council on Faith-Based and Neighborhood Partnerships. Commuting between UCC Headquarters in Cleveland, meeting with the advisory council in Washington D.C., and leading her church in Florissant has kept her busy. She believes some progress has been made, though she also says there’s still a lot of work left to do. For 2007 alumna Rev. Susan Sneed, the protests in Ferguson that followed Michael Brown Jr.’s killing weren’t something she watched on the news. She could smell the tear gas in her house. Joining in the protests was a given for her, as a citizen, an ordained minster, and a community organizer with Metropolitan Congregations United. Through her work, Sneed is currently collaborating with a taskforce to address police reform. “So many [faith-based] leaders care about the police and what they do, but they’re also appalled by the police and what they do,” she said. Her group is creating progress reports to measure if local police departments are meeting the progress goals they set for themselves. Sneed is also helping church leaders monitor a community benefits agreement with the Metropolitan Sewer District. “It’s important to work to ensure economic equity. The community is paying for it, and they should be the first on the list to be hired,” said Sneed. Women and men from any denomination are invited to explore a theological education and a vocation in church leadership. Eden Theological Seminary’s Explore Scholarship is a full tuition scholarship for any student who enrolls fulltime in the Master of Divinity (M.Div.) degree program for their first year of study. The Explore Scholarship is available to all students in the M.Div. degree program. To qualify for the degree program, prospective students must have completed a bachelor’s degree with a 2.7 GPA or above and be a person of faith involved in a church community. First-year students must also participate in contextual education, sometimes referred to as field education. Contextual education students work 10 hours a week with an Eden approved site and participate in a ministry seminar group for theological reflection. There are no strings attached to the Explore Scholarship. This initial tuition-free first year provides an opportunity for students to explore theological education and to discern just how important this call is in their life. Eden’s student body currently consists of women and men from approximately 18 denominations. Fifty percent of Eden students are women, with student ages ranging from the 20s to the 70s. Eden is a school of the United Church of Christ and is an Open and Affirming seminary. For more information or to begin the application process, please contact Tiffany Pittman, Director of Admissions, at (314) 918-2504 or request more information via the link below. 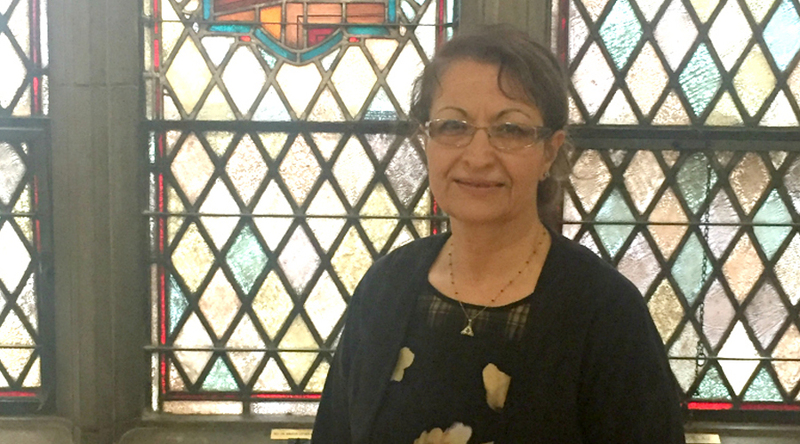 From Feb.-April 2017, Eden welcomed Dr. Mualla Selçuk to campus to serve as scholar-in-residence. A resident of Turkey and Islamic scholar, she has added vibrancy and depth to Eden’s ongoing dialogue surrounding interfaith concerns. “Since I’ve been at Eden, I’ve felt a part of the community. I’ve felt very welcome. I am Eden’s first Muslim scholar-in-residence, and I’ve been grateful to have a true experience around encounter. This is what my work focuses on—encounters of differences. It doesn’t have to be religious. It could be sexuality or cultural—an encounter of anything or anyone that is not like us. God wants diversity and wants us to enrich each other with what we have to become fully human. This is the journey of becoming fully human,” Selçuk said. Selçuk graduated from Ankara University School of Divinity with a B.Sc. She was appointed as a research assistant in the same school and later granted a Ph.D. following the dissertation of her doctoral thesis titled “Religious Patterns in the Education of Pre-School and School Age Children.” In 1999, she was appointed as a full professor of the religious education department and has since held a number of leadership positions. Currently, Selçuk serves as director of the Continuing Education Center at Ankara and as president-elect and chair of the Religious Education Association, which will hold its annual meeting in St. Louis in fall 2017 with the theme “Learning in Encounter.” Her research includes published work on religious education in school and Islamic religious education in democratic cultures, interfaith religious education, and approaches to teaching from the Qur’an.